Light ceilings are not only trendy, they are firmly established as modern architectural features and lighting elements. Whereas light ceilings covering 25 m2 were once a sensation, 1,500 m2 is not uncommon today. 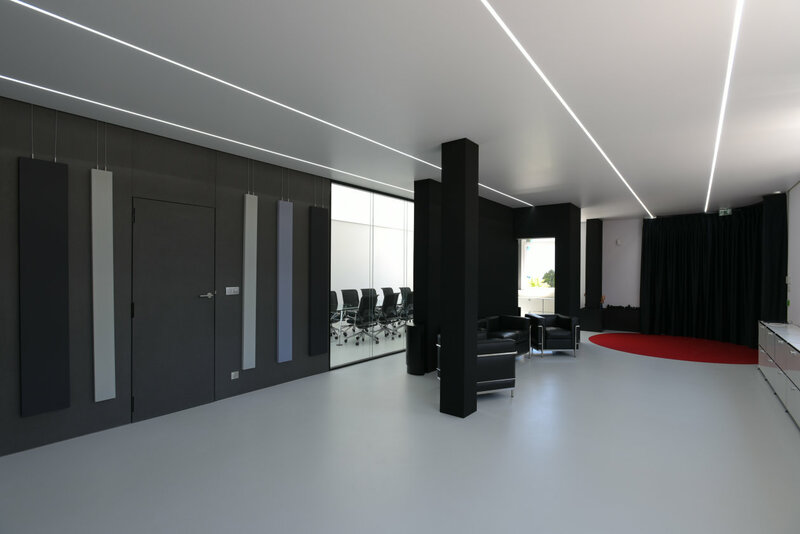 At their new joint showroom for office applications in Saint-Louis near Basel, BARRISOL and OSRAM are demonstrating how light ceilings can be used and controlled in innovative ways. Since it opened architects, lighting designers and lighting planners have had the opportunity to see the latest impressive solutions for smart office lighting and building design in action and to benefit from leading-edge know-how and comprehensive services for implementing their own projects. In only eight months from the drawing board to the official opening, OSRAM and BARRISOL, the world market leader in stretch ceilings, completed their spectacular joint showroom in Saint-Louis, France. The showroom was designed specifically for office applications and combines state-of-the-art system solutions for indoor and outdoor lighting, air conditioning, acoustics, architainment and light management in typical prestige rooms. The stretch ceilings from BARRISOL are a key element in all the rooms. In perfect combination with various OSRAM LED solutions they act as light ceilings but also in some cases incorporate other functions. The air-conditioning in various rooms, for example, is concealed and silent behind air-permeable stretch ceilings and walls. Special solutions from BARRISOL also result in amazing improvements in acoustics, particularly in rooms with modern minimalist design. The specific benefits of high-quality LEDs and modern LED technology are ideal for light ceilings thanks to their compact dimensions, low thermal output, very high luminous intensity, homogeneous illumination, ease of adaptability to different structures, robust design and long life. OSRAM is setting new standards in all these disciplines. OSRAM is a one-stop shop for everything from individual LEDs and LED modules in every shape, color and light output to perfectly matched drivers and control systems. Up to now, lighting planners and architects tasked with designing and implementing light ceilings, especially high-coverage ones, have had to overcome the problem that conventional tools and methods are not able to deliver accurate calculations of illuminance levels on desks. OSRAM has therefore developed a special tool for professional lighting customers that enables LED light ceilings of any type and shape to be specified with a high degree of precision and is easy to use even for novice users. OSRAM EINSTONE is the perfect platform for implementing numerous location-based and mobile applications, indoors and outdoors. The 24 Vdc EINSTONE beacon modules are a stable and secure solution linked directly with the lighting installation. This not only guarantees an optimum arrangement of the beacons but also reduces maintenance time and associated costs many times over. There are seven OSRAM EINSTONE units integrated throughout the showroom, greeting visitors and accompanying them as they move around the showroom. Push messages to their smartphones or tablets tell them which BARRISOL and OSRAM products are installed in the various areas of the room. With OSRAM EINSTONE many more actions and interactions, such as guided tours, are both conceivable and feasible. In the entrance area sleek light lines with OSRAM LINEARlight Flex Power Tunable White LED modules producing 3,000 lm per meter provide a warm, bright and friendly welcome. The extremely low-profile LED modules integrated in the BARRISOL BLANC White ceiling have a modern decorative effect – and at 100% luminous flux provide illuminance of 400 lx at floor level which more than meets the prescribed value. The huge media wall in the lobby is a real eye-catcher. It is equipped with the new BARRISOL 3D ELT woven fabric and backlit with 92 OSRAM LINEARlight Flex RGB LED modules. With the new e:cue DMX Sympholight system from OSRAM a total of 276 DMX addresses can be individually controlled. Visitors can also take a look behind the scenes. The media wall opens up like a door to reveal the LED modules installed behind it. Behind the next “door” is the operating and control equipment, which take up very little space and control all the technical systems for the showroom, from the lighting to the air-conditioning. 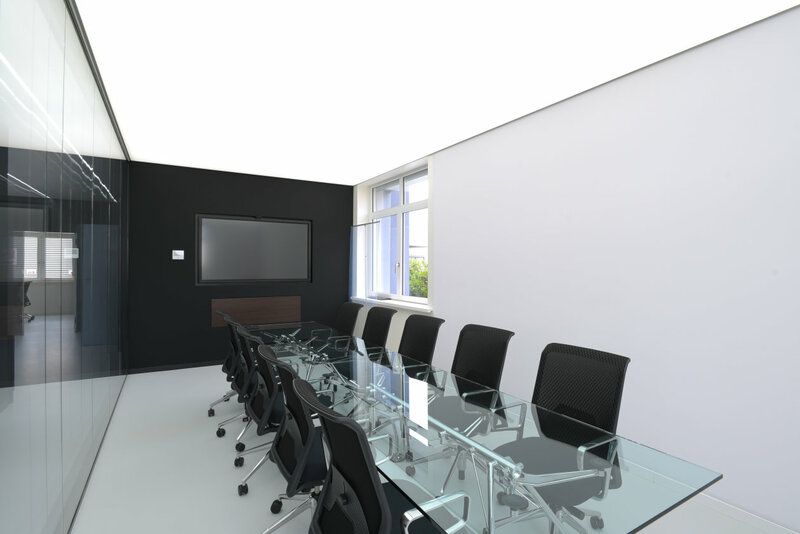 The conference room features an HCL light ceiling. At 100% luminous flux, 680 OSRAM BackLED Tunable White Plus LED modules produce an illuminance of 2,650 lx on the conference table and 1,800 lx at eye level (vertical illuminance). State-of-the-art control technology ensures that the lighting is always matched to changes in natural daylight and therefore human biorhythms, changes in the weather, different room usages and different tasks. OSRAM LINEARlight Flex LED modules with a warm white 4,000 K light color and excellent color rendering (Ra 90) in combination the OSRAM LS/PD MULTI 3 CI light and presence sensor automatically provide subtle, stylish and functional illumination in the toilets without the need for a manually operated light switch. Despite the conscious choice of dark ceiling and walls, very bright and uniform illumination is achieved with only a few LED strips and just one LED spotlight over the washbasin. In the two office rooms, which at first sight appear absolutely identical, 100 OSRAM BackLED Tunable White Plus LED modules are used to backlight a complete light ceiling. They provide the prescribed homogeneous illuminance of 500 lx on the desk at 100% luminous flux. As in the conference room, the light in the second office meets the requirements of Human Centric Lighting (HCL) and follows the changes in natural daylight throughout the day. Another highlight of the two office rooms is one that is heard but not seen. The first room has BARRISOL non-acoustic light ceilings and materials, whereas the second room features acoustically optimized technology which reduces noise from the surroundings in particular while simultaneously enhancing the audibility and comprehensibility of voices and sounds directly in the room. This encourages much greater concentration and more efficient communication, particularly in open-plan offices. Renowned Italian lighting designer and architect Piero Castiglioni was tasked with designing the lighting for the outdoor area. Among other things, he created a new outdoor LED luminaire featuring OSRAM LINEARlight Flex RGB3 Protect and LINEARlight Flex Protect ShortPitch LED modules. Lighting control in the entire showroom, indoors and outdoors, is simple and efficient thanks to innovative OSRAM drivers and LMS solutions such as OPTOTRONIC OTi DALI 75/220‐240/24 1…4 CH and DALI Professional Controller‐4 RTC.